If you’re looking for a serious meal replacement smoothie to cover all of your macronutrient needs (those are your proteins, carbs, and fats), this is it. 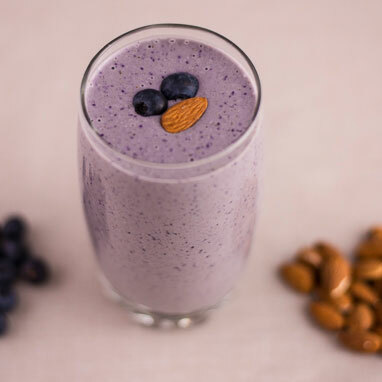 Almond milk and almond butter offer an excellent, dairy-free source of healthy fats that will make you feel full long after most smoothies have worn off. Complex carbs and whole grains in the rolled oats shouldn’t be left out here, though. The fiber from the whole grains also fills you up and plays a key role maintaining a healthy heart and weight. Throw in a heaping scoop of protein powder and you’ll be ready to take on the day. Do note, however, that this is an overnight-type prep—don’t forget to leave time to stick the finished product in the fridge so the oats will soften and soak up all the delicious flavors in this smoothie.